I’ve been asked for this recipe quite a lot, so here goes. It’s a bit of a ‘think a number’ one, like most of my recipes are but it’s very easy to adjust for a different number of portions. The sauce is made from egg yolks, Parmesan and cooked pasta water rather than cream. 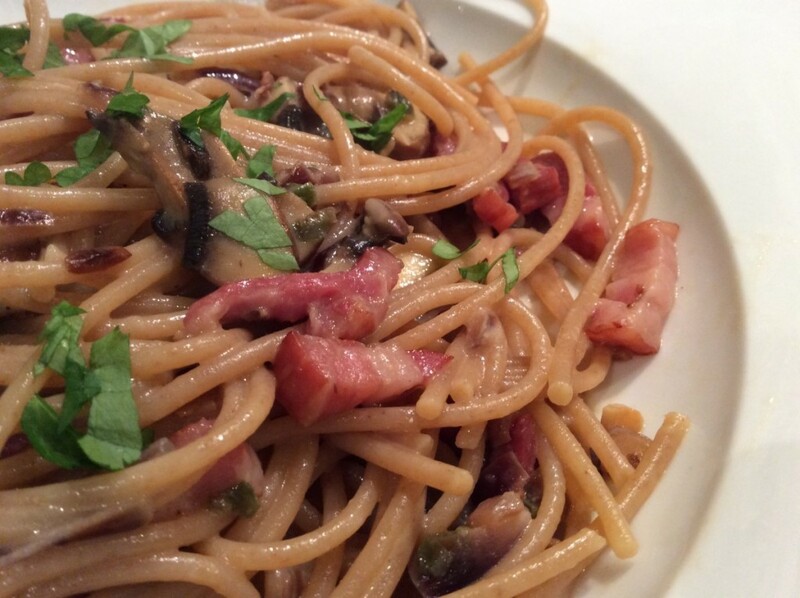 I make it vegetarian by adding courgette and mushroom or traditional by using pancetta or bacon. Heat a glug of oil in a large frying pan over a low heat and very slowly & gently sauté the onion, garlic & chilli until the onions go really sticky. This will take 15-20 mins. Stir occasionally. Whisk the egg yolks & Parmesan together, set aside. Meanwhile, cook the pasta until al dente. Drain but reserve approx 250ml of the cooking water. Turn up the heat under the onions and add the pancetta and mushrooms, cooking quickly until the meat is golden, stirring constantly. Turn off the heat and add the pasta to the frying pan along with the yolks, Parmesan and enough of the cooking liquid to create a loose sauce- the pasta will soak up lots of the liquid. Stir well to combine and serve topped with chopped parsley & Parmesan. Chilli and mushrooms in a carbonara. No, no, no!